Background: Drug abuse is one of the major concerns of human societies. The relapse of abusing drugs is one of the main targets of addiction therapies. Studies in this regard have introduced four basic mechanisms: 1) drug-induced reinforcement 2) cue-induced reinforcement 3) stress-induced reinforcement and 4) negative reinforcement. Objective: In recent studies, cognition has got great interest in addiction research. It has been proposed that prefrontal cortex can reduce the risk of relapse, by influencing cognition. In this review, we are going to discuss the benefit of better cognition in the context of the above four basic mechanisms, not specifically prefrontal cortex. Method: A literature search was conducted in all major indexing databases including Pubmed, Embase and Google Scholar. The included articles were not limited to the time of publication and all relevant articles were used. Results: Our findings suggest that cognition is necessary for controlling drug abuse. 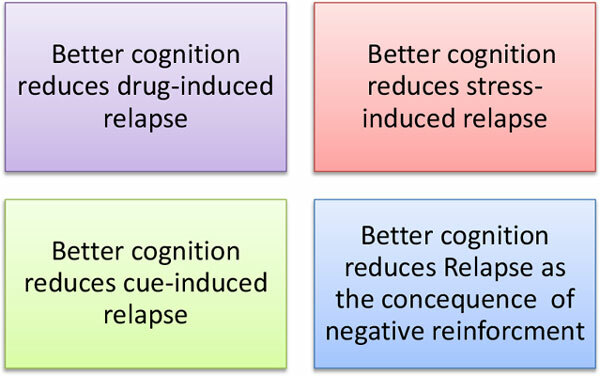 Also, it was found that cognition may control relapse to drug abuse by influencing the four basic mechanisms that are responsible for relapse to drugs. Conclusion: Cognition is a necessary factor for controlling drug abuse. It suggested paying special attention to cognition before implementing a plan for treatment of relapse to drug abuse. Addiction, relapse, reinstatement, cue, stress, abuse.